This Chewy Gluten Free Chocolate Chip Cookies Recipe makes such good cookies, no one will even know they are gluten free. 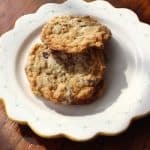 This chocolate chip cookie recipe tastes surprisingly like Mrs. Field’s Cookies without the nuts. Amazing. Awesome. The BEST Gluten Free Chocolate Chip Cookies. Get the tip for making them chewy. Hi. It’s Lois telling you about my favorite (and Don’s!) 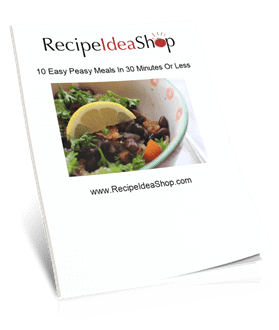 Chocolate Chip Cookie recipe, Chewy Gluten Free Chocolate Chip Cookies Recipe. 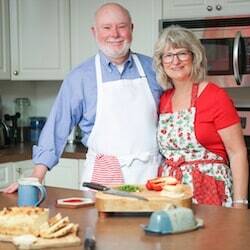 I have made a lot of cookies, breads and cakes over the past few years, trying to make these delicious treats gluten free. The flavor has been terrific, but the texture has always left something to be desired. Until now. These Gluten Free Chewy Chocolate Chip Cookies are awesome. The texture is perfect. People who distain gluten free will be fooled into thinking they are made with regular wheat flour. I recently discovered the secret for baking gluten free cookies and breads that have the same, wonderful texture as wheat-based goodies. What’s the secret? Psssst. Want to know? Xanthan gum has a number of powerful properties. First, it works as an emulsifier, encouraging liquids that normally don’t like one another to mix together. Second, it works as thickener, increasing the viscosity of liquids and batters. Third, it can create a creamy texture. In the world of gluten-free baking, xanthan gum plays the crucial role of imitating gluten. In baking, gluten is what makes dough “doughy.” It gives the dough elasticity, as well as viscosity. Those properties help to hold a cookie together while it bakes on a sheet in the oven, and they enable cakes and breads to hold onto the gas bubbles that form inside them—this allows them to rise and take shape. Xanthan gum helps replicate these properties in recipes that do not contain gluten. KitchenAid Stand Mixer. Buy one on Amazon today. 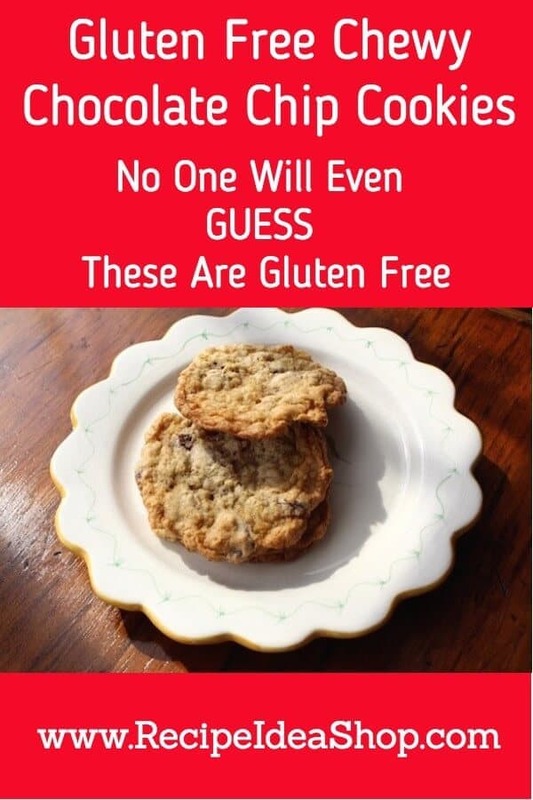 This last weekend I made some pretty amazing Gluten Free Chewy Chocolate Chip Cookies using this favorite Gluten Free Chocolate Chip Cookies recipe. I use my KitchenAid Stand Mixer to make cookies. And I do like my cookies chewy. These cookies are awesome. Consider adding a teaspoon of baking powder (listed as optional) to the mix for a fluffier cookie. These Gluten Free Chewy Chocolate Chip Cookies are so good, no one will even know they are gluten free. 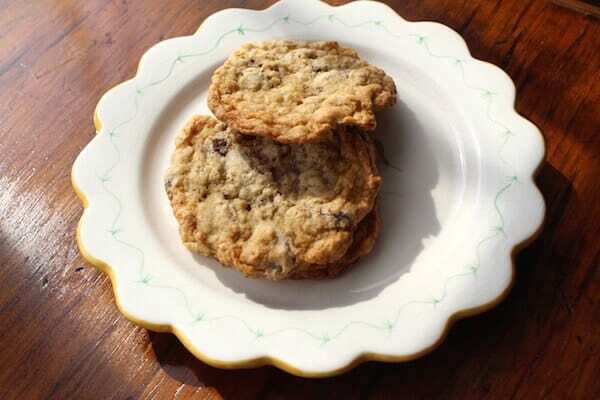 This chocolate chip cookie recipe tastes surprisingly like Mrs. Field’s Cookies without the nuts. Mix the butter, sugars, eggs, vanilla and salt until well blended. Add the gluten free baking flour and sprinkle the Xanthan Gum and baking soda (and baking powder, if using) over the other dry ingredients. Mix the dry ingredients a little (I use a wire whisk). Now thoroughly mix the dry ingredients into the butter mixture. Bake at 375F degrees for 8-10 minutes, depending on whether you want your cookies chewy or crispy, until the cookies are lightly browned at the edges (see note) for chewy or golden brown for crispy. Remove the cookies from the baking sheet and cool on a cooling rack. Store in a sealed container. NOTE: The secret to making the cookies chewy is to underbake them a little bit. Take them out of the oven when the glossiness has disappeared and the edges are just starting to turn a little brown. If you wait until the top of the cookie is browning, the cookies will be crispy, not chewy. 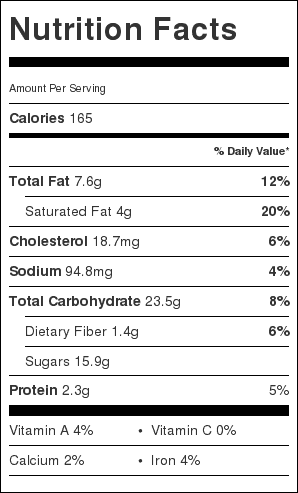 Chewy Gluten Free Chocolate Chip Cookies Recipe Nutrition Label. Each serving is one cookie.